The great horned owl was spotted swimming in a canyon in the US. While hiking through Face Canyon in Lake Powell, US, Derrick Zuk and his friends saw something very rare - an owl swimming in the lake. Even though the incident took place last year in May, the video surfaced and went viral on social media only a few days ago. It shows the owl, identified by the National Geographic as a great horned owl, swimming in a narrow water body, using its wings in a way that resembles a human breast stroke. According to the National Geographic, it is likely that the owl is a young one - it still had some of its nestling feathers - that fell out of its nest and into the water. Experts also point out that swimming is the last resort for birds, as they have no way to defend themselves while in water. 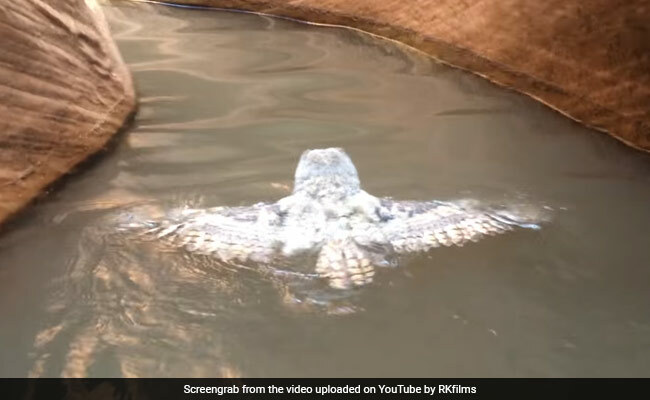 In this video, the wonderful multi-tasking owl managed to reach the end of the water body and will have to dry its feathers before taking flight again. "This bird is young enough that the parents were probably still caring for it, so hopefully once the folks go by, the bird dried off and its parents found it," says the director of the National Audubon Society, Geoff LeBaron, to the National Geographic. Since being shared online one day ago, the video has collected over 87,000 views on YouTube. Another version, shared by the National Geographic on June 13, has over 2 lakh views. In 2014, the video of an owl swimming in the Lake Michigan had gone viral. What do you think of the footage? Let us know using the comments section below.